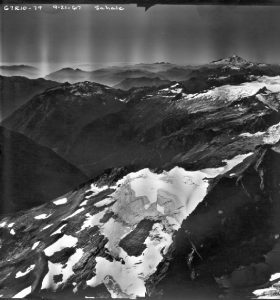 From 1960-1979 Austin Post, USGS photographed North Cascade glaciers from the air. 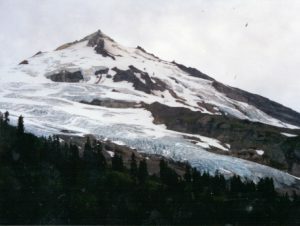 He donated the pictures below to the North Cascade Glacier Climate Project in 1994. In 2005 and 2006 excellent SPOT Imagery is available. We have also used some spectacular photos from Leor Pantilat. All other photographs are taken by NCGCP. 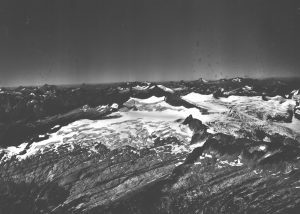 We have completed field measurements of each of the 35 glaciers below and use the aerial photographs to present a broad view that is lost when taking a picture of the glacier from the ground. From 1944-1976 conditions became cooler and precipitation increased (Hubley 1956; Tangborn, 1980). 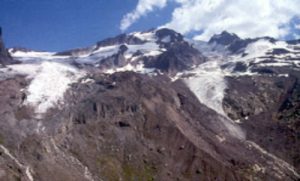 Approximately half the North Cascade glaciers advanced during the 1950-1979 period, while the remaining glaciers continued to retreat at varying rates (Pelto and Hedlund, 2001). Harper (1993) examined six Mt. 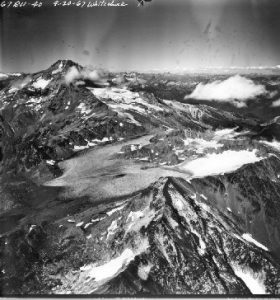 Baker glaciers and found all retreated a significant distance after 1940, and all six were advancing by 1960. 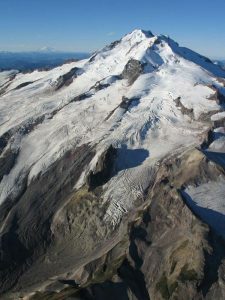 On Mount Baker all 12 glaciers advanced during this period, again indicating their sensitivity in responding to climate (Harper, 1993; Pelto and Hedlund, 2001). By 1992 all 47 glaciers termini observed by NCGCP were retreating (Pelto, 1993). 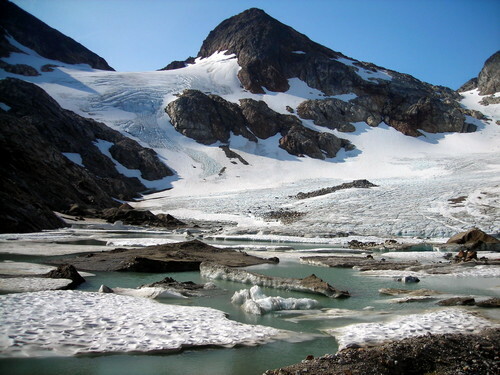 By 2006, four had disappeared Lewis Glacier, David Glacier, Spider Glacier and Milk Lake Glacier (Pelto, 2010). 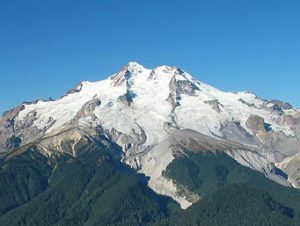 The retreat on each Mount Baker glacier was measured in the field from benchmarks established in 1984 or 1985 at their recent maximum position (late 1970’s-early 1980’s). In each case a maximum advance moraine had been emplaced. The advance moraines were quite prominent in the 1980’s as each was ice cored increasing its topographic prominence. By 1997-1998, the average retreat had been -197 m (Pelto and Hedlund, 2001). The retreat has continued to 2014 with the average retreat of 430 m for the nine principal Mt. Baker glaciers in this interval. 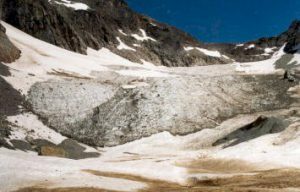 Foss Glacier located on the northeast side of Mount Hinman, retreated 86 m from 1950-1979, 112 m from 1979-1997 and -290 m from 1997-2005. 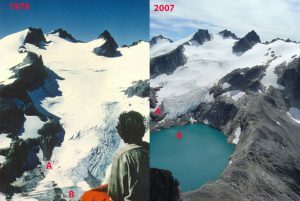 The glacier has lost half of its area since 1992, note picture at left comparing 1988 and at right 2005. The red line shows the 1985 glacier margin. 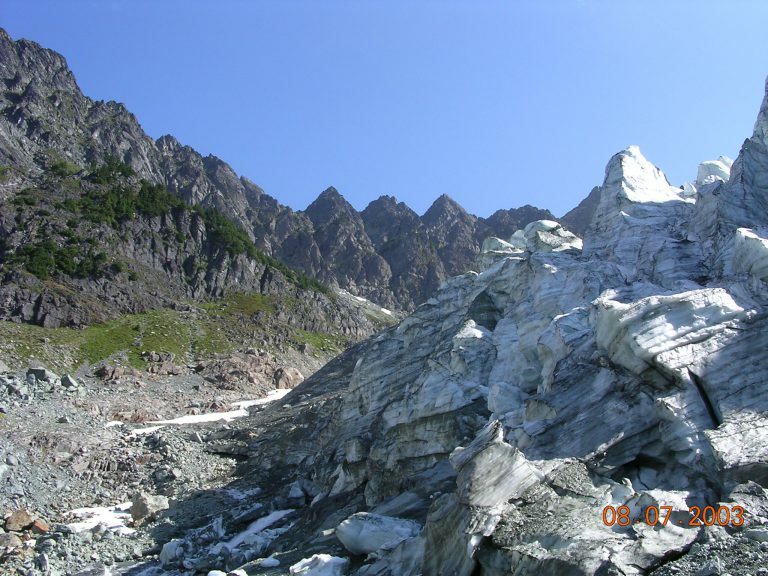 This glacier is a type 3 glacier and is rapidly disappearing and with present climate will not endure. Daniels Glacier on the northeast side of Mount Daniels retreated only 20 m from 1950-1979. 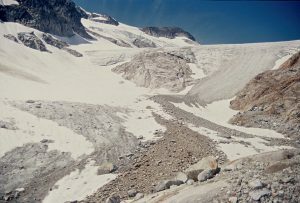 From 1979-1992 the glacier retreated another 25 m. From 1992 to 2005 the glacier has retreated 441 m. The upper section of the glacier has thinned and new rock areas are showing through. 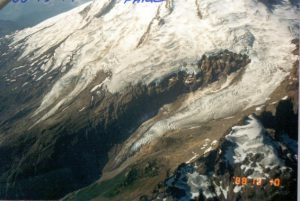 The long lower margin of the glacier extending to the right has melted out in 2005. 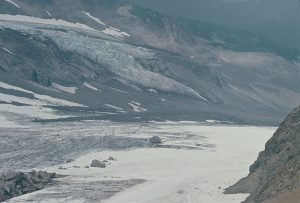 The glacier is losing area rapidly and is honeycombed with subglacial caves with thin ice above, ready for more rapid retreat of this type 2 glacier. 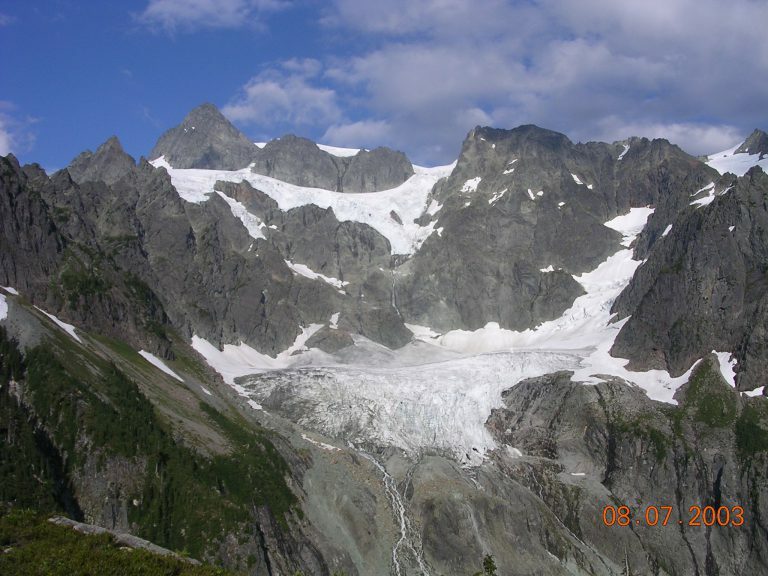 Columbia Glacier is the lowest elevation large glacier in the North Cascades and is a type 2 glacier. Sitting below Monte Cristo peaks it has tremendous avalanche accumulation. 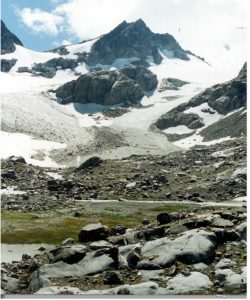 The glacier retreated slowly 15 m from 1950-1979. 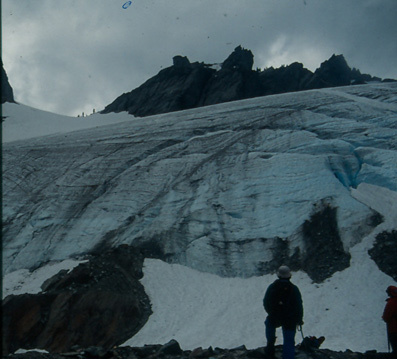 The glacier has retreated 94 m from 1979-2005. 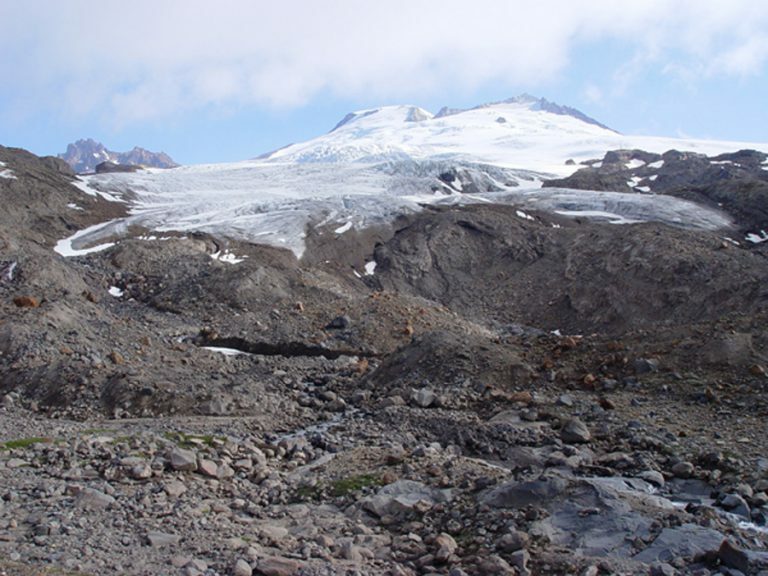 The glacier has thinned considerably from the terminus to the head some 13 m during this latter period. The top of the glacier is retreating down from Monte Cristo Pass 80 m since 1979. This glacier is very thick over 250 feet in the center but with current climate will still melt away, albeit slowly. 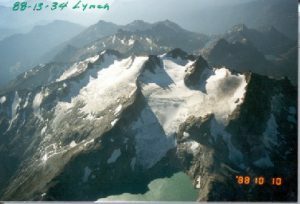 Pictured above is the glacier in 1989 at left and 2005 at right. 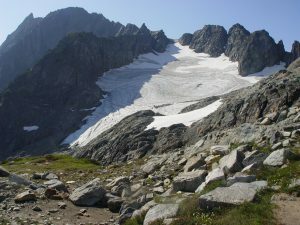 Note the accumulation layers exposed by melt in 2005 as viewed from Monte Cristo Pass at left, and the lack of any accumulation at the end of 2006 at right. 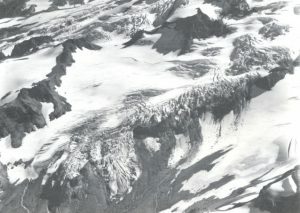 Whitechuck Glacier in 1967 (Post) was a very large glacier with a northern and southern branch. and an area of . 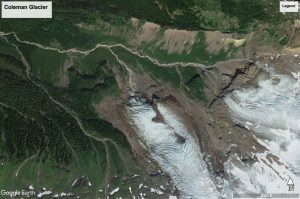 By 1988 above right the glacier had retreated 240 m. Below right in 2006 (SPOT Imagery) the northern branch had melted away by 2002 (note death of a glacier). The lake in the center of the 2005 image is not present in 1988. 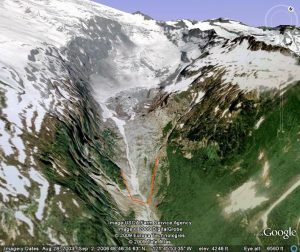 The southern branch had retreated an additional 165 m. This glacier is thinning along its entire length and will not survive current climate. Chocolate Glacier advanced from 1950-1979 some 400 m. In 1946 (Long) at left note the size of the glacier is still just a bit larger than in 2005 , but will be back to the same position probably in the coming summer. This is a Type 1 glacier that remains vigorous and will survive current climate. 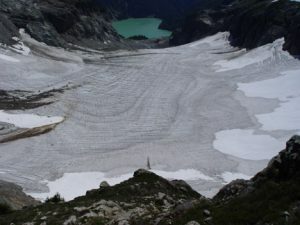 The lower 350 m of the glacier were stagnant in 2005. 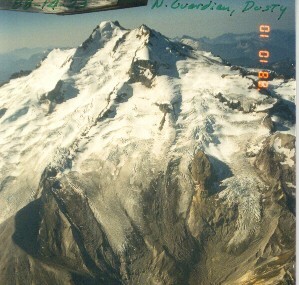 North Guardian Glacier is a type 1 glacier that advanced 160 m between 1950 and 1979. 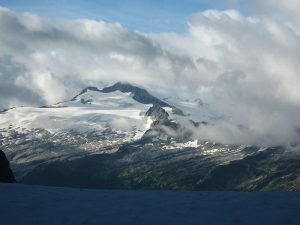 The glacier then retreated 175 m from 1979 to 2005. The retreat has continued with a total of 335 m of retreat by 2015. he glacier remains active throughout its length and will survive the current climate with an additional retreat of several hundred meters. 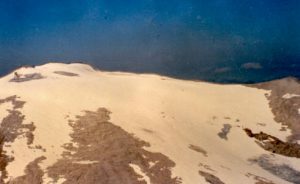 The snowpack in late summer of 1972 at right (Post) led to the advance. The non-existent snowpack in 2005 (Imler) will ensure continued retreat. 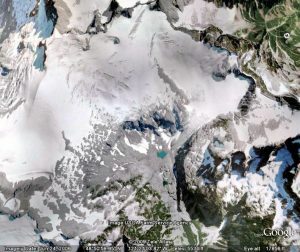 Dusty Glacier is a type 1 glacier shown here in a 1988 image of the entire glacier, a 1997 image from the accumulation zone and a 2015 Google Earth image The glacier advanced 280 m from 1950-1979. From 1979-1997 it retreated 210 m. From 1997 to 2005 it retreated an additional 170 m. From 2005 to 2015 the retreat continue with a total retreat of 515 m since 1979. 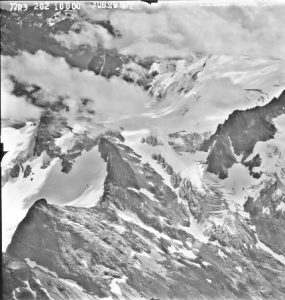 Ermine Glacier at left (Post) in 1955 was advancing. This type 1 glacier advanced 170 m from 1950-1979. By 1997 the glacier had retreated 108 meters. 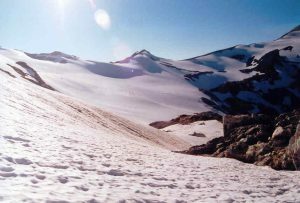 From 1997 to 2015 the glacier retreated an additional 130 m.
Ptarmigan Glacier advanced during the 1960’s and began retreating by 1986. 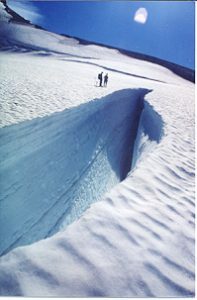 The glacier had retreated 190 m by 2003. note the complete loss of snowcover in 2005; however, the considerable crevassing indicates a glacier that is still active. Total retreat from 1979 to 2015 is 290 m.
Kennedy Glacier is a Type 1 glacier that advanced 330 m between 1950 and 1979. 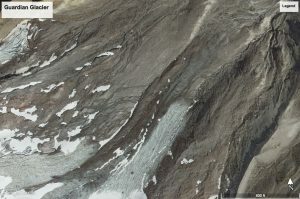 By 1997 at right the glacier had retreated 151 m. From 1997 to 2006(SPOT Imagery) the glacier retreated an additional 200 m. In the 1994 picture at left the advance moraine is evident as a notable ridge 90 m below the terminus at left. By 2015 total retreat from the advance moraine is 400 m.
White River Glacier is a Type 2 glacier that retreated 140 m from 1950-1979. 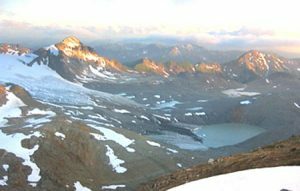 From 1979-2005 the glacier retreated 184 m. The retreat has exposed two new lakes not evident in the 1988 image. At left the 2006 image (SPOT Imagery) indicates the western lake is still mostly ice filled. Honeycomb Glacier is a type 3 glacier that retreated 290 m from 1950 to 1979. 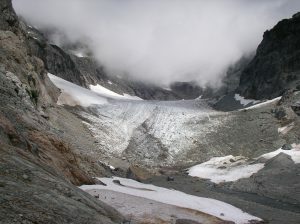 The glacier has retreated 430 m since 1979. 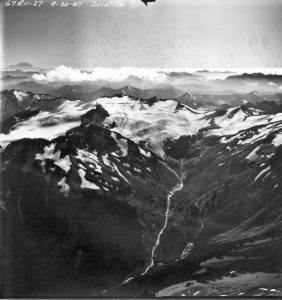 In 1973 (Arundell) above right the glacier still is vast as it sweeps past the nunatak. 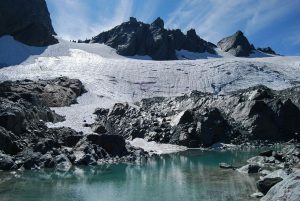 The retreat has exposed a new lake that the glacier was still touching in 2002 . 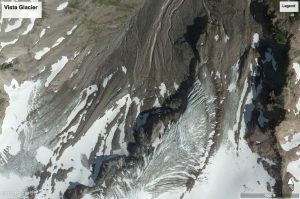 At right in 2006 (Skoog) the glacier has retreated from the lake and the glacier is separating into two tongues below the nunatak seen at left. This glacier is still very large, but will have to retreat considerably to approach equilibrium. 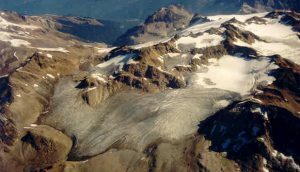 it is the only Type 3 glacier that seems able to survive the current climate. 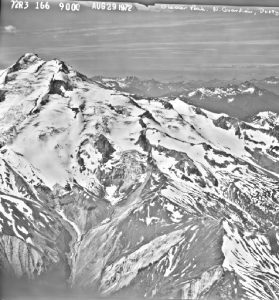 Suiattle Glacier retreated more than any other Glacier Peak glacier after the Little Ice Age, but stopped retreating by 1955 and advanced slightly during the 1970’s (Post 1967). Until 2001 the retreat of the terminus was slow amounting to 105 m (first image). 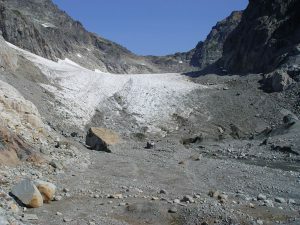 The glacier retreated another 70 m by 2006. Retreat then accelerated with a 200 m retreat up to 2015. 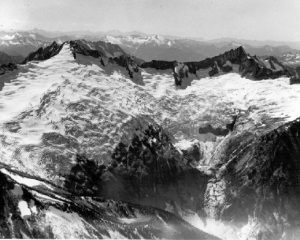 Cache Col Glacier in 1916 at left from Sahale Arm is a type 2 glacier that retreated 25 m from 1950 to 1979 and has retreated 72 m from 1984 to 2005. 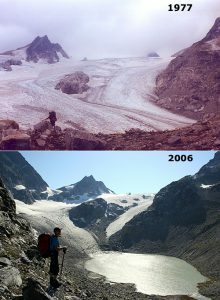 The glacier has thinned dramatically from the 1916 image to the 2003 image. 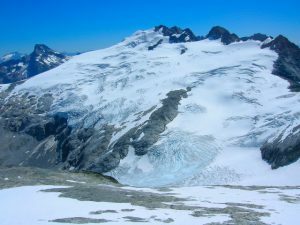 Sahale Glacier is a type 2 glacier that retreated only 12 m from 1950 to 1979 and 60 m since. 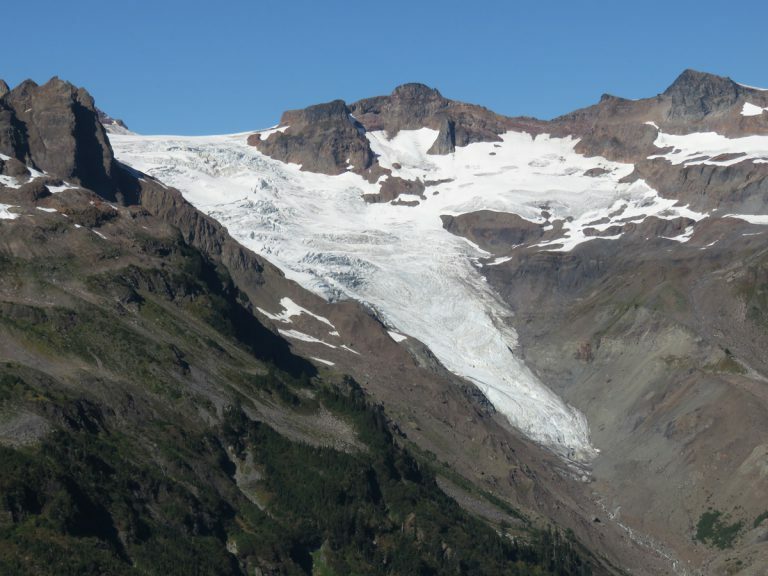 This niche glacier has not thinned dramatically since 1979 and is faring better than any other glacier that is Type 2. The change from 1967 (Post 1967) to 2008 is not that dramatic, with limited ice loss except in the glacier center. Chickamin Glacier did not advance appreciably at its main terminus in the 1960’s, but the terminus above the ice cliffs at right did. The width of the lower section of the glacier in 1979 (Post) is considerably less than in 2006 (Spot Imagery). 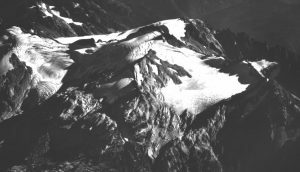 Overall glacier retreat since 1958 is 338 m.
Boston Glacier is a type 1 glacier that is seen advancing in this 1972 image (Post). 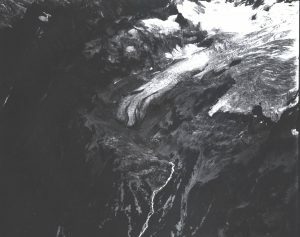 By 2006 the entire lower terminus tongue seen in the right center of the image has melted away resulting in a retreat of 448 m. There is a small lake evident in the basin now ice free (Pantilat). 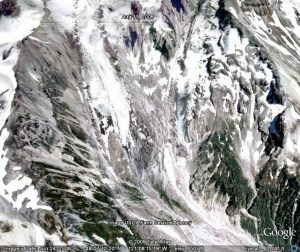 Middle Cascade Glacier: Has been retreating slowly since 1950. 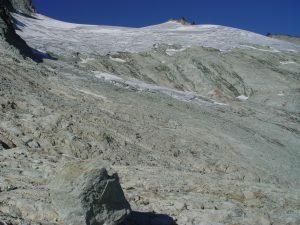 The glacier terminus ends under a debris pile and is difficult to define. The glacier from Formidable that fed the west side of the glacier in 1979 (Post) separated from the glacier in 1994. The glacier extneds little beyond the this former connection today. 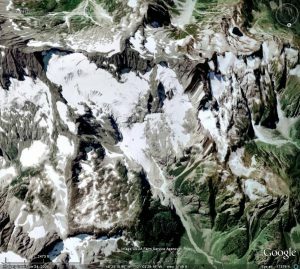 The retreat of visible active ice since 1979 is 260 m. The most problematic change for the glacier is the thinning in the icefall region, which in 2005 (Spot Imagery) is dangerously narrow to maintain a connection to the upper glacier. 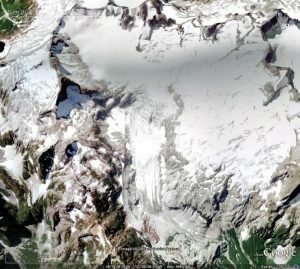 Colonial Glacier is a type 3 glacier that is melting away a new and expanding lake is seen in 2006 and not in 1979 (Post). This lake developed in the mid-1990’s. 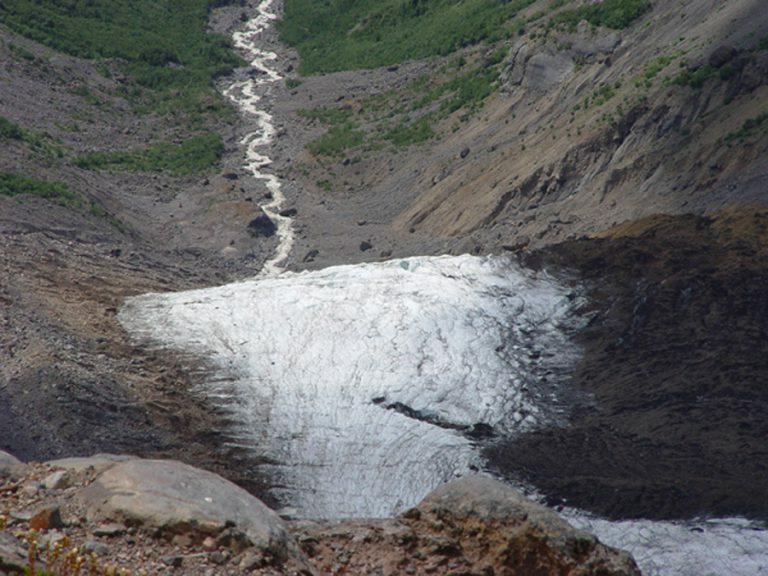 Retreat from 1950-1979 was 81 m, slow as the glacier thinned. 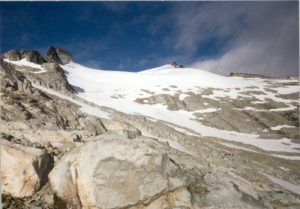 The glacier retreated 135 m from 1979 to 2005. 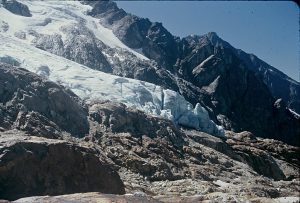 Ladder Creek Glacier is a type 1 glacier that advanced 105 m from 1950 to 1979 and has retreated 190 m by 2006. (Post) and (SPOT Imagery) Below is the active front in 2001. 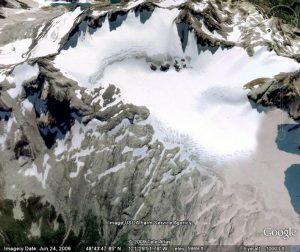 Banded Glacier at right in a 1960 image (Post)and at right in 2006 (SPOT Imagery). 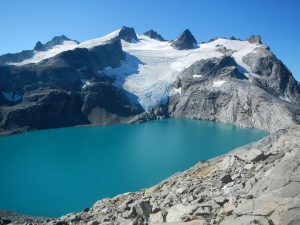 The glacier has retreated 450 m in this period expanding the proglacial alpine lake. 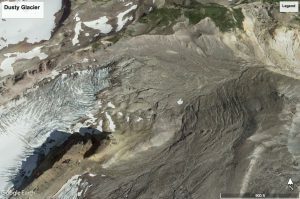 Note the spread of rock outcrops in the accumulation zone suggesting this glacier will have trouble surviving. Challenger Glacier The expansion of the ice free area to the east of the main terminus shown in 2006 (SPOT Imagery) at left (Pantilat) is evident versus the 2002 image at right. 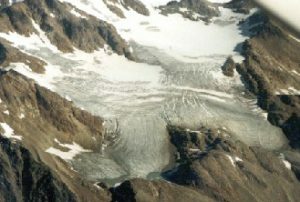 Watson Glacier is a small type 2 glacier that retreated only 25 m from 1950-1979. 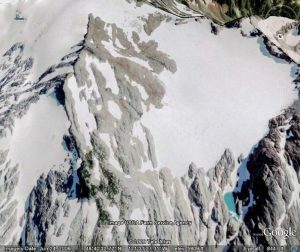 The glacier has retreated 105 m since. Given the overall length of the glacier is less than 350 m this is substantial. This small niche glacier will not survive the current climate. 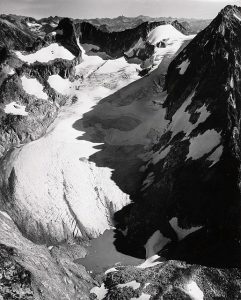 At left in 1989 the Watson glacier can be seen from bottom to top. The tenuous hold on the face of Mt. 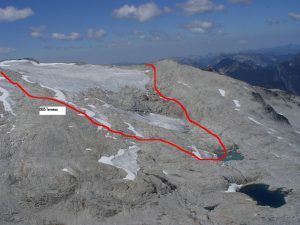 Watson is evident in 2007 as the glacier terminus is not as the glacier has retreated to the top of a rock band and is less convex. Noisy Creek Glacier: In 1979 (Post) Noisy Creek Glacier which is at right, upper sections was joined to its lower section. 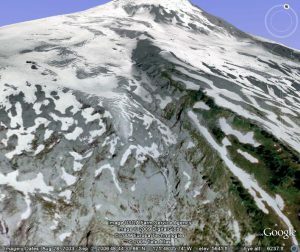 By 2006(SPOT Imagery) the glacier has divided into an upper and a lower section. 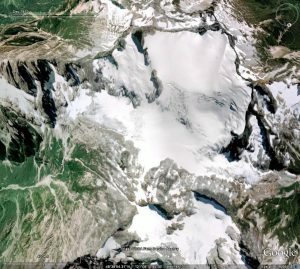 A new lake is also forming due to glacier retreat. 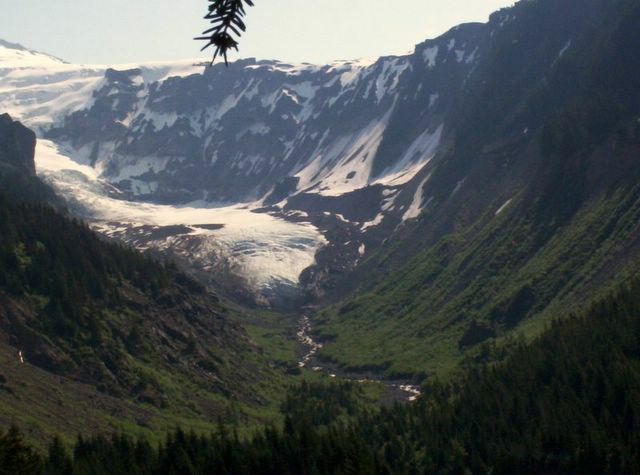 Hidden Creek Glacier in 1979 (Post) had only a small outcrop in the center of the glacier. 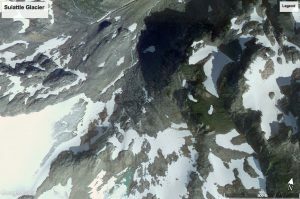 By 2006 (SPOT Imagery) there were three substantial rock outcrops in the middle of the glacier. 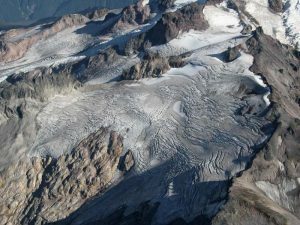 Coleman Glacier drains the northwest side of Mount Baker and is joined with the Roosevelt Glacier in its accumulation zone. 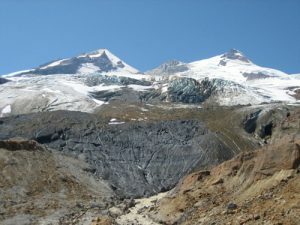 The glacier drains the largest area of the volcano above 3000 m, which combined with its steep slope leads to a higher velocity and more crevassing than on other glaciers. 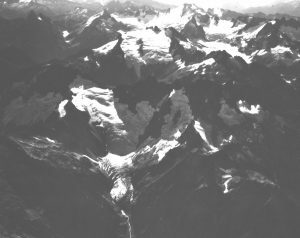 The glacier retreated 2600 m from a joint terminus with the Coleman Glacier at its LIAM, dated to 1823 by Heikkinnen et al (1984) to 1949. 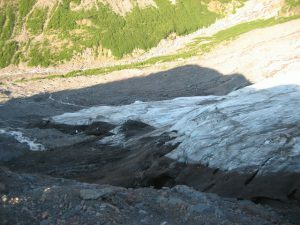 The glacier separated from the Roosevelt Glacier in the 1930’s. By 1949 the glacier had reached a minimum position (Bengston, 1956), before advancing 350 m by 1979 (Harrison, 1960; Harper, 1993). 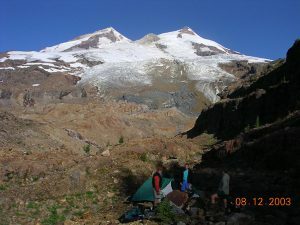 The advance terminated in the bottom of the Glacier Creek valley. From 1979 to 2014 the glacier has retreated up the west side of the valley wall, 480 m. The most rapid period of retreat was from 1979-1998. 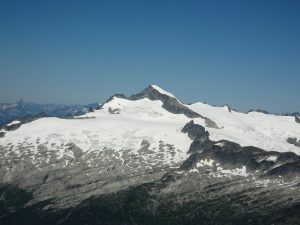 The snowline has averaged 2100 m during the 1990-2010 period, which is too high to maintain the current terminus position. 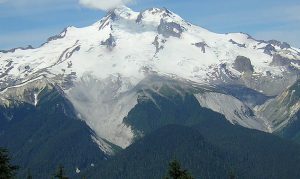 The current terminus descends over a steep lava flow and has active crevassing indicating slow retreat in the near future. 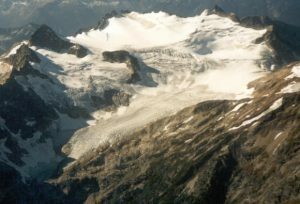 This glacier is currently the most active in the terminus region. The extensive melting in 2013-2015 may change this. 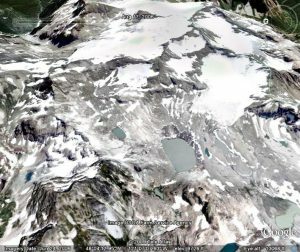 Deming Glacier (Post 1979) advanced dramatically during the 1950’s and did not retreat substantially before 1990. By 2015 the glacier had retreated 615 m . The icefall leading to the terminus has notably less crevassing than 10 years ago. Deming Glacier below in 2006 the ice has retreated since 1980 from the obvious vegetation line in the upper part of the image. 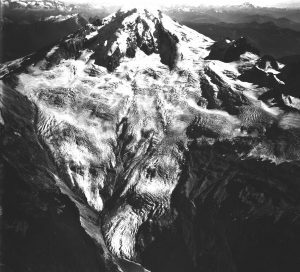 Easton Glacier was the slowest Mount Baker to begin to advance after 1946, beginning its advance in 1955. In 1990 the glacier had pulled back just 10 m from its advance moraine. 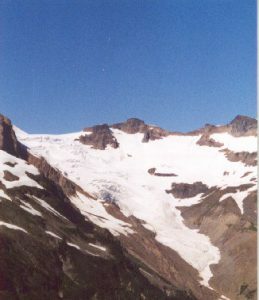 At right is the glacier in 2003, with a steep crevassed tongue. In 2015 at right the glacier had retreated 320 m from its advance moraine onto a gentler slope with much less crevassing. 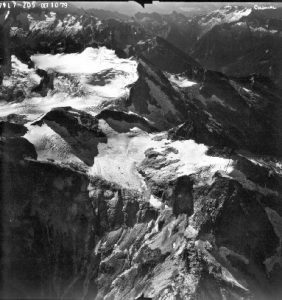 Boulder Glacier was noted to be advancing by William Long in 1954. 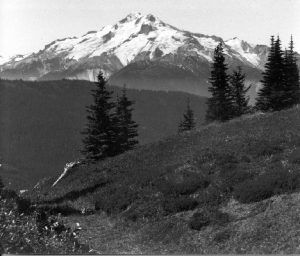 The glacier advanced m more than any other on Mount Baker by 1975. 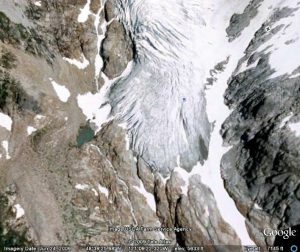 The glacier retreat was slow up to 1987 a total of 25 m. By 2015 the total retreat has amounted to 520 m. The lower section of the glacier below the lowest icefall is stagnant and will be lost. The retreat of the glacier from 1993 to 2003 is evident at right. 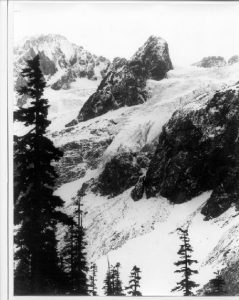 Below is the glacier in 1908 viewed by Asahel Curtis. 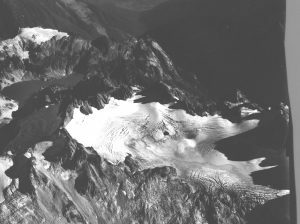 Park Glacier advanced vigorously from 1950-1975. During this period and up to the late 1990’s frequent avalaching down the cliffs could be seen and heard. 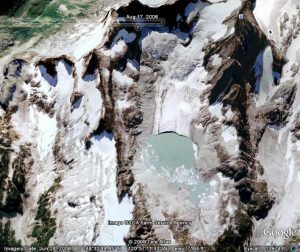 By 2006 (SPOT Imagery) this is a rare event as the ice cliffs poised above the lower glacier have shrunk back and are no longer steep cliffs. Now this is largely a gentle melting margin. 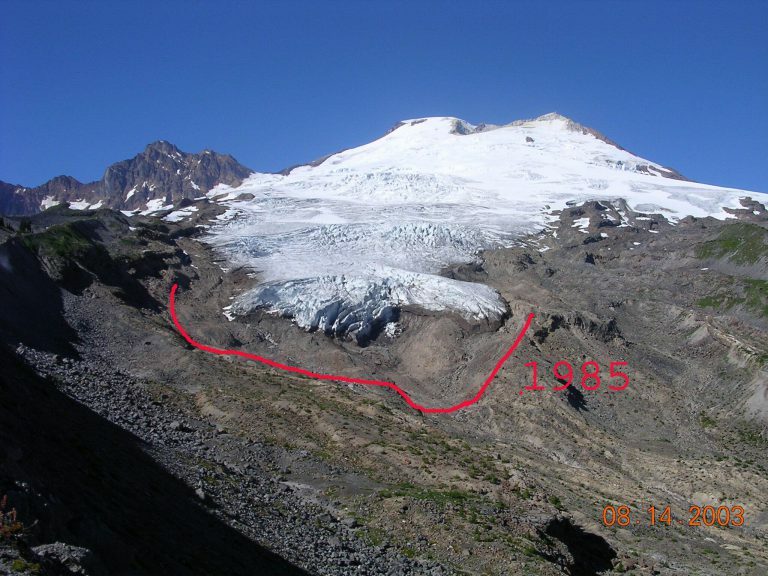 The glacier has retreated 360 m by 2015, note orange line of 1979 terminus. 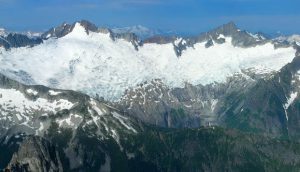 Squak Glacier at left in 1990 had completed a vigorous advance and had retreated just 35 m from its 1970’s advance position. 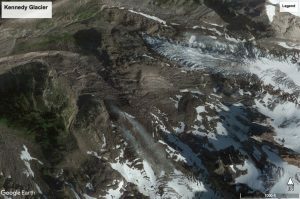 By 2005 (SPOT Imagery) the glacier had retreated well upslope from the waterfall visible as a light streak at right where the glacier terminated in 1990. By 2015 the glacier had retreated 300 m.